St. Augustine Beaches News Journal November 2013 4 News From Around St. Johns County St. Augustine Crescent Beach ATLANTIC OCEAN St. Augustine Beach St. Augustine Shores The vigil took place on Thursday October 3, 2013 in the Plaza downtown at 7pm. We honored the victims and survivors of domestic violence in St. Johns County. The names of the deceased were read aloud and 2 courageous survivors spoke to the crowd about their story of survival. Law enforcement spoke about the need to make domestic violence a talked about crime. Domestic Violence Survivor Vigil Community members with Corporal House Staff Gregory Hughes Survivor speaking to the crowd CEO Joyce Mahr, President Karen Taylor, Survivor Speaker Marie Clee Enjoy our beautiful Northeast Florida coastal habitat, featuring landscapes of St. Augustines Anastasia Island, November 21, 2-4 pm. Meet at the Coquina Quarry in Anastasia State Park, 1340-A State Road A1A South where specialists will provide information about Florida native plants in their natural habitat. Continue the tour to an award-winning home landscape where native plants will be observed in a suburban setting. Only Florida native plants look and function like REAL Florida. Education and inspiration will be offered by Nature Columnist Beverly Fleming, Native Plant Consultant Renee Stambaugh, representatives from the St. Johns County Audubon Society and the Florida Native Plant Society. This event is free and open to the public. For more information go to www. nativeplantconsulting.com or call 904-692-3927. Native Landscapes Tour The St. Johns River State College Phi Theta Kappa honor society held its fall induction ceremony recently. The new members lit candles and recited their oath in front of family and friends at SJR States St. Augustine campus. A reception followed the induction ceremony. The St. Augustine campus new chapter members are: Laeequa Ali, Amir Antonios, Amber Babcock, Brandon Badejogbin, Cassady Bryant, Michael Dale, Judith Ennis, Gregory Francois, Summer Goldman, Bryce Hager, Janie Hinson, Tristan Hood, David House, David LaFlam, Arianna Landess, Ciara Lawrence, Lea Mangino, Kelsey Martin, Jana McDermott, Allyson Menshouse, Amaya Munoz, Brittany Pina, Kaitlin Rafay, Rebecca Ray, Lissette Rose, Georgette Semaan, Rebecca Siguenza, Reginald Tolbert, Trista Trott, Joseph Whaley, Preston Williams and Tiffany Zanzarella. To join PTK, members must have completed 12 credit hours at a two-year institution and hold a 3.5 grade point average. The organization also promotes scholarships. To learn more about the Phi Theta Kappa honor society, visit www.ptk.org. SJR State College Honor Society Inducts 32 Members Sertoma 2013 Compassion 5K Race Sertoma of St. Augustine presents the 2013 Compassion 5K on Saturday, November 9th 2013. registration ends on October 30th and on line registration is available at www.compassion5k.org. There will be an awards ceremony following the race. Custom made medals will be awarded cash prize. For all registered participants there will be a post race prize drawing as part of the race and Air Conditioning Inc. families that are currently living with a major health crisis, many of which are life threatening. With the help of the Sertoma of St. Augustine, many local businesses and community volunteers, the Compassion 5K is able to help these families manage their crises during their greatest time of need. All proceeds from the race are used to help community members in St. Johns County. If you need additional information please contact me at 904.806.2730. A fairy tale opera for the whole family will be performed on Sunday, November 10 at 4:00 pm, in Lewis Auditorium at Flagler College, 14 Granada Street in downtown St. Augustine. The Grimm Brothers story is familiar to everyone; this production will be sung in English by professional singers. The St. Augustine Youth Chorus (formerly the St. Augustine Childrens Chorus) will appear for the second time with First Coast better way to do that than to include the chorus in a production? The children will sing the roles of angels, animals in the forest, and the gingerbread children. Hansel & Gretel, written by Engelbert Humperdinck, will be directed by Karl Paoletti, the Father. Singing the role of Gretel will be his wife, soprano Ronda Paoletti. Hansel is Berger, from Atlanta. The role of the Mother will be sung by mezzo-soprano Janet RabeMeyer, from Daytona, while the wicked witch will be played by mezzo-soprano Regina Torres from Jacksonville. Sandman and Dew Fairy will be sung by Carmella Turner of Augustine. Ticket prices have purposely been kept low so that parents or grandparents can bring children. Adult tickets are $25, child or student with ID is $10; a special family ticket (2 Adults & 2 children) is priced at $50. Tickets may be purchased online at www. FirstCoastOpera.com, or by calling 904-417-5555. Tickets purchased online or by phone will be available for pick up at the Will Call desk one hour before show time. Tickets will also be available for purchase, after Oct. 12, at Herbie Wiles Insurance, 400 N Ponce de Leon; Southern Horticulture, 1690 A1A South; and The Bag Lady, 112 St. George Street. This performance will have open seating. FIRST COAST OPERA OPENS 14th SEASON WITH HANSEL & GRETEL Members attending the ceremony were: Samantha McLennan (recording secretary), Kelsey Martin, Amber Babcock, Cassady Bryant, Judith Ennis, Arianna Landess, Ciara Lawrence, Rebecca Ray, Trista Trott, Sarah Tanner (vice president of service) and Heather Pennick (president). Michele Petrilli (vice president of leadership), Laeequa Ali, Michael Dale, Brandon Badejogbin, Gregory Francois, Jana McDermott, David House, Reginald Tolbert, Tiffany Zanzarella and Amir Antonios (vice president of service). 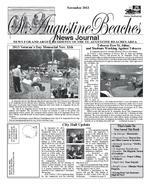 St. Augustine Beaches News Journal November 2013 16 Florida has over seven hundred miles of barrier islands along both the Atlantic and Gulf coasts. Chains of these protective sand formations are found along coastal areas all over the world. Although there are, of course, many different kinds of islands, Anastasia is a perfect example of this particular kind of barrier system. Every day of the year, weather permitting, residents and visitors alike can climb the St. Augustine Lighthouse and observe the geologic forces which are responsible for the creation of these long and narrow "spits". Some of the different mechanisms which are at work include tidal range, wave energy, seasonal storms, sediment supply and sea level trends. All of these forces interact to determine the slope, shape and size of a particular beach. Human engineering (intervention) also plays a significant role. Most recently St. Augustine Beach dredged 2.1 million cubic yards of sand from the Vilano Inlet and deposited it along more than two miles of eroded beach, at a cost of 17 million dollars. Beneath the sandy dunes and hammocks of Anastasia are thick layers of coquina rock in various stages of consolidation. Comprised almost entirely of the fragmented shells of the delicate and tiny donax clam (coquina), the oldest formations of this natural building material dates to the Pleistocene epoch, 110,000 years ago. Which is a good estimate of the age of our island! A coquina chimney is all that remains of the Spanish "King's Quarry" Who was the first individual to make a legal claim for ownership of the entire island? Jesse Fish, a notorious St. Augustine merchant and shipmaster also, slaver, smuggler and userer who managed to "acquire" a 10,000 acre land grant directly from the Spanish Crown in the mid 1700's. The Fish family planted the first commercially successful citrus plantation on the island, and experimented widely with other crops. Although the Fish family owned "Santa Anastasia" for over a 100 years, the Spanish Crown did not relinquish control of their precious coquina quarry.